Luton boss Nathan Jones admitted that the loss of star striker Omar Bogle on transfer deadline day for this afternoon's opponents Grimsby Town was a real plus for his side. The much sought after forward, who was top of the division’s goalscoring charts with 19 efforts this term, out of a total of 35 for the Mariners, joined Championship side Wigan Athletic on deadline day. Grimsby’s next highest marksmen in the league, Adi Yussuf, Dominic Vose and Tom Bolarinwa are all on just on two apiece as Jones said: “Grimsby will be a stern test, they’ve lost a big player for them in terms of Bogle and that’s a positive for us if you like, but they have other players who can step in. “They’re a good side, have a good structure about them, the lad (Jamie) Osborne has already scored against us and he’s gone there from Solihull, so they have good threats. “But we’re going there as Luton Town and we’ll concentrate on what we’re good at and hopefully get the right result. He added: “We’ve talked about it, we couldn’t fathom, we’ll take a different approach when coming to these games now. “They do (knock us back), as win would have taken us a point behind third, would have taken us six behind second with a game to play these people as well. “So it would have been all in our own hands, and there’s a lot of games to go, a lot of important games. “If we have some sort of form like we had second half of the season last year, we’ll end up in the play-offs. “We think we’re a better side, we think we’re a more advanced side now, as we have proved in games that are parallel to last year. 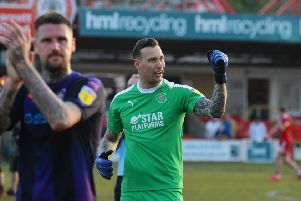 “So we want to go for that automatic spot and fortunately enough, Plymouth lost as well, so it doesn’t take second place away from us,. “It’s just a frustrating little thing. Now look, they go about my gameplan, superbly well, we had over 600 passes the other night, had a lot of possession, we didn’t penetrate enough, but we still had enough chances to win the game. “So if we defended well, we still would have scored two and probably would have scored more as well, with the chances we had. “We should have had a penalty at the end, the referee’s been bold enough to apologise for that because it was a clear cut one and he knows it.